In a pot warm milk and melt butter together (do not boil) then add vanilla extract and transfer to a large bowl. Combine eggs and sugar together, mix well and pour into the milk mixture, use hand whisk to stir till sugar dissolved. Sift plain flour, baking powder and cocoa powder together and pour into the milk mixture and stir until smooth. 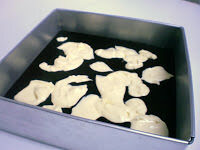 Pour mixture into a lined 9″ square cake tin. Beat the cream cheese and sugar together at low speed,gradually add in whipping cream and vanilla extract ~beat until creamy, add in egg yolk and beat until smooth. 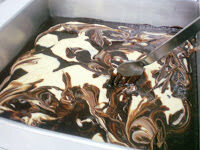 Pour the cream cheese mixture on to the brownies, use fork gently stir to create a swirling pattern. Remove cake tin from oven and leave cheese brownies to cool. This recipe is a keeper! Thanks to Anncoo. I have made this 3 times and will be making the 4th time after this message. 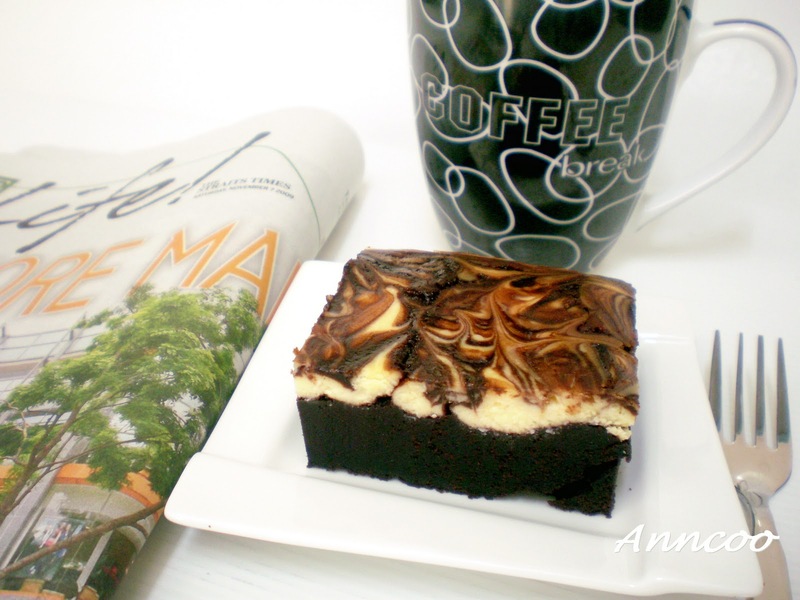 The creamcheese brownie is so nice to eat and definitely a great dessert on the table. Hi Ann, thanks for the link. I may have overbaked the cheese part because it cracked at the top and I did not chill the cake at all but ate that very night. Do I need to water bath this cake? Thanks! Ann, the marbled effect of my cake is not as beautiful as yours. The bottom of brownie is like kueh texture altho it is quite soft in the center. The cheese flavour is not strong enough so it tastes more of a chocolate cake than cheese……I am very sure I have done something wrong somewhere…please advise me. Thanks for your help! Ann, this cake is now baking in my oven……this is my 1st attempt with cheese so hopefully it will turn out well. The whole family is waiting eagerly for this cake as they LOVED cheese and brownies!!!!! Ann, do you mean to place the baking tin right at the lowest level or 1 level below the center? Thanks! Ai li, when I said lower rack is 1 level below the center. The cake will cracks after baked. Thank you, Gelareh. Please visit often. Olive, Heavenly Housewife, Leslie, Doria: Thank you so much for your compliments. mmmm.I love me some cream cheese brownies!!! Quelle merveille ton dessert ! j'adore ces deux couleurs et les saveurs doivent être exquises ! These look amazing, I love the marble effect. wow.. breathless when i see this.. phewwwww….extremely tempting! Murasaki, Angie: Thank you for your nice words. This is a super rich, eggy, chocoatey, and yummy treat! Trish: Thank you! Please visit often. 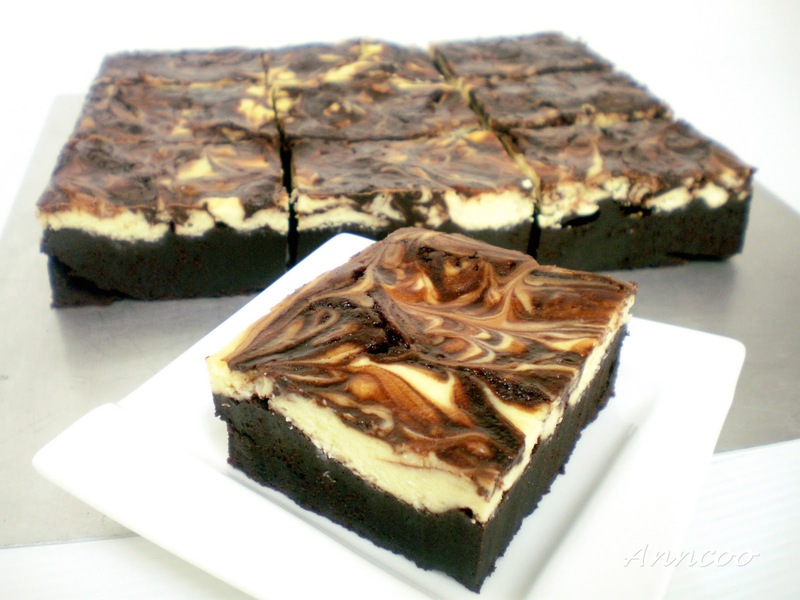 I make a similar 'brownie cheesecake'…but this looks heavenly! Sonia: Welcome back! Will this in the next round, OK? Anymore left for me? this is nice to eat together with a cup of coffee..
Gulmohar, Lyndsey, Sangeetha: Please join me for breakfast now. whoa, this looks incredible. I'm hungry and wish I had some right now. Oh my they look so good! I need to pour myself a cup of coffee and have a piece right now! Yum! You did a great job on the swirl job and you got such nice clean cuts. Wenn: I hope you like this recipe after trying it. yr recipe is very easy to follow..will bake cheese cake one day..
Anncoo these look AWESOME. I am a huge lover of cheesecake so this looks fabulous. The pictures look so enticing!!! I have just finished lunch and wish I could have a piece for dessert! Gorgeous ! A real greediness ! A2Z, Juliana, Foodie: Thank you very much for your lovely comments. Beautiful! I bet they are yummy too! These cheese brownies are such a great dessert, so creative, look absolutely delicious…nice nice pictures! Wow they look so delicious, look like a work of art. 5*Foodie & Lauren: Thank you for your nice compliments. Delicious =D. These look fantastic!! These look absolutely scrumptious! Would love some right now! Dear All Friends: Thank your for your nice compliments. Sanjana: Me too! Wonder can bake without eggs. oh my goodness! tt looks beautiful! i'm printing this, thanx! Oh my gosh! I'm inlove! It looks sooo fudgy and I am such a fan of that. DO you mind giving me some? Hehe. So beautiful, and I bet they taste amazing. Great blog!